Upon entering Ajo, first-time visitors are always struck by the beauty of the unique plaza. Two hours by car from Phoenix, or two and a half hours from Tucson, Ajo is one of Arizona's best kept secrets. It has a rich history dating back hundreds of years and today is a popular tourist destination and retirement mecca offering an inexpensive lifestyle. 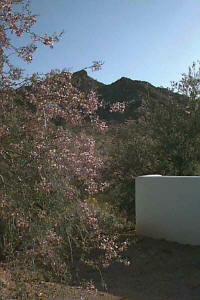 Natives, Spaniards and Americans have all extracted mineral wealth from Ajo's abundant ore deposits. Around 1800, there was a Spanish mine here nicknamed "Old Bat Hole." It was later abandoned due to Indian raids. The first American in Ajo came in 1847 and found the deserted mine complete with a 60-foot shaft, mesquite ladders and rawhide buckets. High-grade native copper, so rich it was shipped to Wales for smelting, made Ajo the first copper mine in Arizona. Ajo did not boom, however, until after 1900 with the advent of new recovery methods for low-grade ore. Col. John Greenway formed New Cornelia Copper in 1906 and expanded on a grand scale. In 1931, Phelps Dodge, the nation's largest copper company, bought New Cornelia. For several decades, more than 1,000 men worked for Phelps Dodge at Ajo. 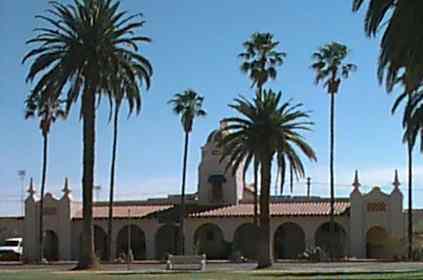 Located in western Pima County, this ethnically diverse town is on state Highway 85, south of Interstate 8. Ajo, at an elevation of 1,798 feet, is unincorporated. Mountains and the Sonoran Desert surround the region. To the west of Ajo is the Cabeza Prieta Wildlife Refuge which was established in 1939 to protect the desert bighorn sheep. The visitor center is located on Highway 85 north of Ajo and is open Monday through Friday. Within 10 miles of Ajo is the Tohono O'Odham Indian Reservation. This reservation has several trading posts where one can purchase jewelry, baskets, and other fine gifts. The woven baskets of this region are much in demand. 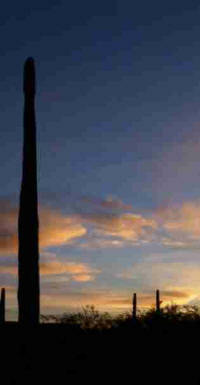 About 34 miles to the south of Ajo on Highway 85, is The Organ Pipe Cactus National Monument. Here, in the desert wilderness of plants and animals and dramatic mountains-and-plains scenery, you can drive a lonely road, hike a backcountry trail, camp beneath a clear desert sky, or just soak in the warmth and beauty of the Southwest. It's 330,689 acres are home to the Organ Pipe Cacti, found nowhere else in the world. The Monument's wildflower blooms are famous world-wide. Farther south in Mexico is Sonoyta, a 400 year old town which was a Spanish missionary outpost founded by Padre Francisco Kino, who followed the Conquistadors into the desert. On down the road, about a two hour drive, is Puerto Penasco (Rocky Point) which is located on the Gulf of California. It is a popular tourist destination offering some of the best deep-sea fishing in the world, fresh shrimp and tropical beaches for sunbathing.